A color guard from the Rolling Thunder motorcycle group greeted more than 200 guests at the dedication last Sunday. Resilient, determined with a never-say-die attitude, Kelly Kowall would have made a great soldier. Instead, after the death of her son in Afghanistan, Kowall set her sights on building a sanctuary for veterans to rest and recuperate. Lukewarm responses were par for the course when Kowall first suggested the idea for My Warrior’s Place in 2009. The recuperative center where veterans, service people and their families could heal their minds and spirit in a relaxed environment seemed like a pipe dream to many. “I left that first meeting with David [Scott] feeling like he thought it was a nice idea but it was going nowhere,” Kowall said. Kowall’s pipe dream has served more than 150 veterans and their families since it opened in 2012, with 17 currently calling the facility home. 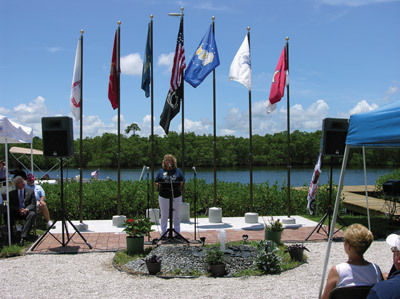 More than 200 people turned out Sunday for the official dedication. “I am ecstatic so many people turned out today,” said Kowall, who is already planning a wheelchair-accessible, three-bedroom, two-bath house on the property. Set in a secluded waterfront area on the Little Manatee River in Ruskin, the facility is home to two houses, four trailers, four RV pads and a laundromat. Amenities include canoes, kayaks, a paddle boat, fishing equipment, a fire pit, screened-in patios, a basketball net, bicycles, exercise room, hammocks, a putting green, boat launch area and dock. 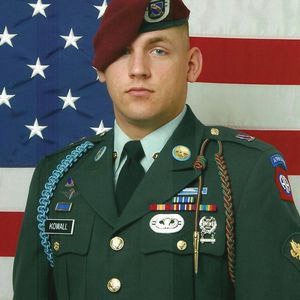 My Warrior’s Place is a tribute to Kowall’s son, U.S. Army Specialist Corey Kowall, who died in Afghanistan on Sept. 20, 2009, while serving with the 82nd Airborne. “To honor my son and the U.S. Army values that he stood for — loyalty, duty, respect, selfless service, honor, integrity and courage, I was compelled to find a way to assist those who were mentally and emotionally affected by some of the complex grief issues that arise when the one who died served in the military,” Kowall said. 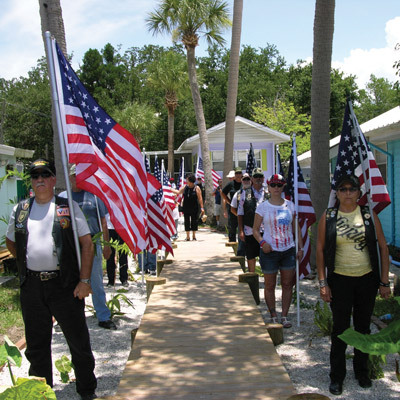 The facility can house up to 18 veterans at a time and features several programs for those who have lost a loved one or witnessed war up close in all its grisly detail. Stephen (who did not want his full name used) said the center is an oasis of calm where he can rebuild his life. 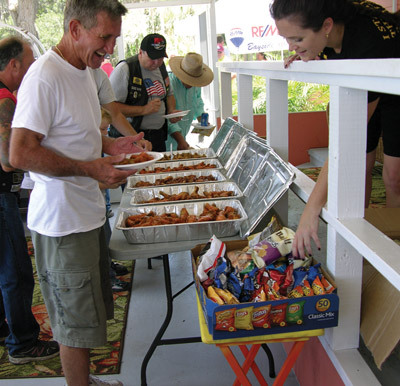 For more information on My Warrior’s Place, visit the group’s website www.mywarriorsplace.org, or call 813-321-0880. U.S. Army Spc. Corey Kowall and a medic died Sept. 20, 2009, while en route to lend aid and support at a location near their base in Afghanistan where improvised bombs were found. Corey was only 20 years old when he died, but he made a lasting impression on all those who knew him. As a child, Corey always wanted to be a U.S. Army Paratrooper. He was a World War II and Vietnam history buff, so much so that his grandfather nicknamed him “Corregidor” after the famous World War II battle. Corey always felt that he was supposed to serve his country; it was what he was born to do, and he lived his dream from an early age. Corey joined the Tennessee Wing of the Civil Air Patrol, or CAP, when he was 10 years old and quickly rose through the ranks to cadet commander during his seven years in CAP. He was also in JROTC and so committed to enlisting in the military that he went to summer school so he could graduate a year early. His father and I had to sign his enlistment papers because Corey was only 17 when he joined the U.S. Army. Corey served with the Alpha Company, Second Battalion, 508th Parachute Infantry Regiment in the Fourth Brigade combat team of the 82nd Airborne Division of the U.S. Army, based at Fort Bragg, North Carolina. His awards and decorations include the Army Achievement Medal, the Good Conduct Medal, the Afghan Campaign Medal, the Army Service Ribbon, the Expert Infantry Badge, the Parachutist Badge and the Bronze Star. A Combat Outpost in Afghanistan has been named COP KOWALL in his honor. Corey carried himself with a deep love for God, country and family, as well as a sense of honor and humor. Corey understood what being an American was truly all about. Corey’s commanding officer, Captain Paul W. Pena, said: “Specialist Kowall was an extremely competent soldier and an extraordinary individual. His death leaves a tear in our formation and in our hearts. Though sorely missed, Corey will continue to be a source of inspiration and strength throughout Alpha Company.” Captain Pena was killed in action in 2010.